It’s a pretty classic brew pub type menu with a nod toward things German—spaetzle, sausages, etc. But I was lured in by the Instagram photo of one of the burgers on the menu, so I decided to get a burger. The picture depicted two patties that were smashed and thin….and you know I like thin burgers. I had the brewery cheese burger ($12) with two thin patties, remoulade sauce, lettuce, tomato and pickle. This was a very good burger. The patties were nice and flat as promised and I liked that the bun didn’t overwhelm it and kind of smoshed down into the burger. The sauce was good, but kind of thin—I used the garlic aioli that I asked for with my fries and smeared a little of that on there too. That burger was really good though—really juicy and just the right proportions. Actually, I think because the bun is nice and soft I might be able to do a single and still enjoy it as much. I look forward to trying the other burger on the menu though, with a big hunk of beer cheese in between the patties. The fries have potential for sure but were cold when they came out. I think if they were cooked just a little longer and were hot, they would be outstanding. It’s early days, so hopefully the kitchen is still figuring it out. My son is a poutine hound and enjoyed their version ($10) with fries, cheese curds, and lots of gravy. 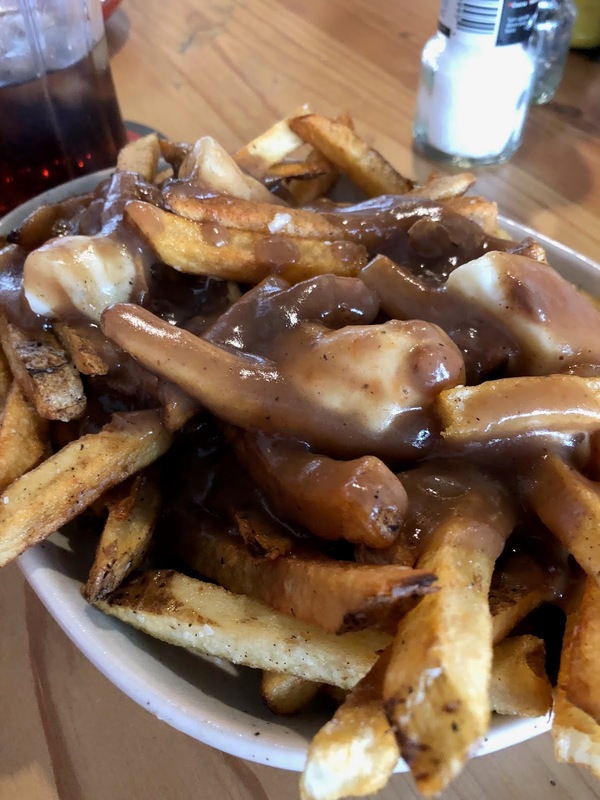 He thought the gravy was a little bland though, and while he ate it, there are others in town he prefers (amazing the variety of poutine we have in Indy now). 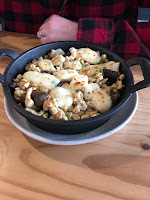 The biggest disappointment was hubby’s spaetzle dish ($10). It was fired spaetzle noodles with cheese curds and mushrooms. 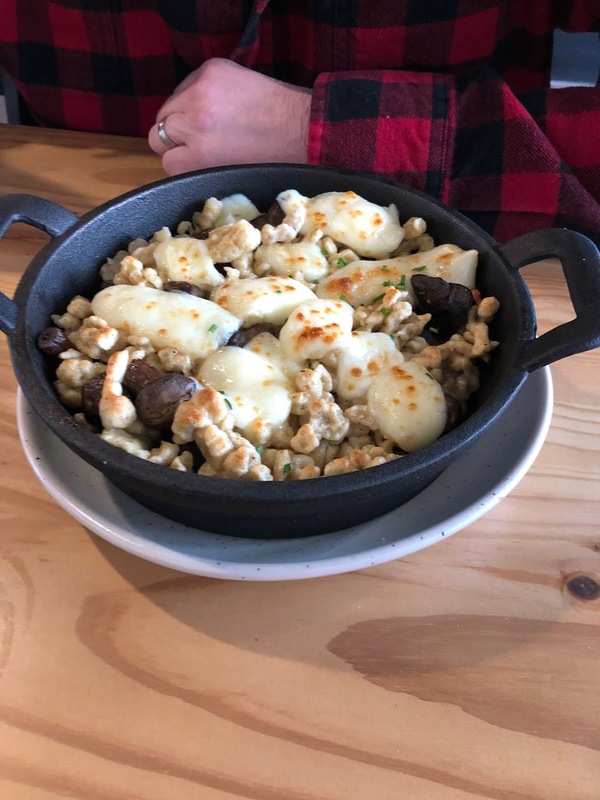 He liked the roasted mushrooms, but the spaetzle was dry and the cheese not very melted (it came off in your fork in one big glob). And overall, it was a pretty bland dish—not a lot of flavors going on here. Hubby really enjoyed his beer though, and part of my burger. All in all, like I said, I see potential here. I think the kitchen is likely still finding its groove. But I highly recommend the burger, and I am sure we will be back to get more of them soon. They have a couple of good brunch items on the weekend that I would like to try as well. They were doing a nice business and our service was pretty good. 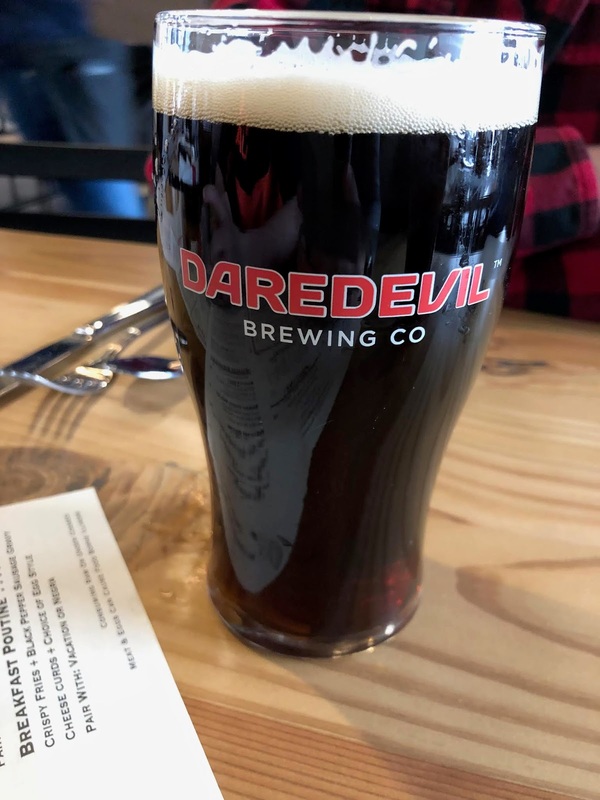 I suspect this place will do well—it’s a nice add to Ironworks for sure and I appreciate that its family friendly. What else has everyone tried? I would love to hear feedback on other menu items. 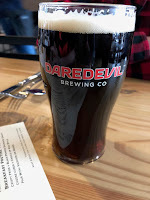 My daughter and I were on our own the other night while the boys were at a Pacers’ game, and since my daughter needs to get more practice driving hours, we decided to head over to Westfield and check out Field Brewing. It’s a happening spot and was quite busy when we got there. They don’t take reservations, so we checked in and were told it would be about 30 minutes. The nice thing is, you can grab a drink and they have a separate building where you can wait with games, a TV and lots of seating. And Mad Libs! That's what we did. I am assuming it has a purpose other than that, but it is nice to not have to cram into the restaurant on a cold night. It looks like when the weather is warm, there will be nice places to hang out and play games outside as well. We were seated in just about the time frame given, but sadly, at a table next to a large window and doors. The whole restaurant is mainly glass and our table was freezing on a cold night. We both left our coats on the entire time, which is sort of a pet peeve of mine. 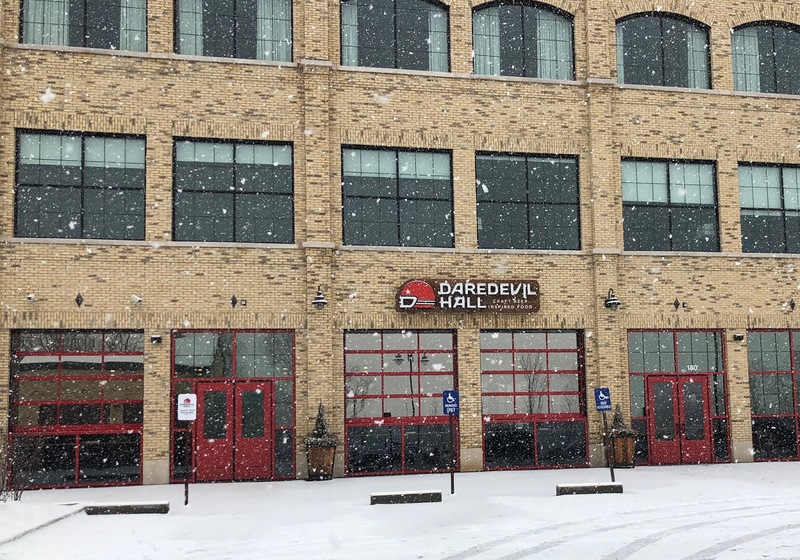 Indiana restaurants: cold in the summer and cold in the winter. I appreciated the noise absorbing foam under the tables and some panels on the wall, because this place can get pretty loud. Our server was a little overwhelmed and our service was a bit spotty and slow. We both got a drink—my daughter had a hot chocolate ($3.50) because she was so cold, and she really enjoyed it. I am not really a beer drinker but enjoyed my glass of wine. I have to say, the appetizers looked very appealing and we had to restrain ourselves from over-ordering. We ordered the pretzel ($6) with beer cheese and mustard, and the deviled eggs ($7). There were a bunch of others I would like to try. 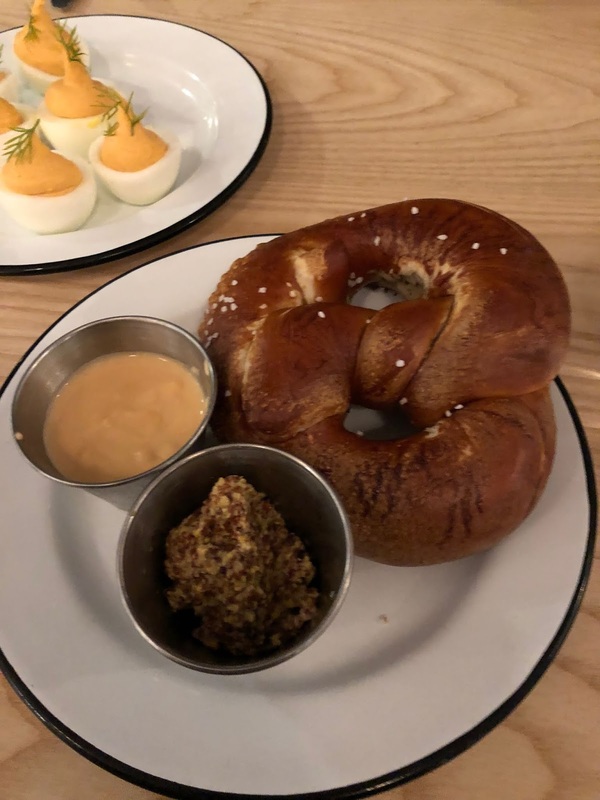 The pretzel was very good and we both really liked the beer cheese. We were nearly licking the little ramekin to get it all out. I do wish the pretzel had a little more salt, but that was the only thing I would change. The deviled eggs though, neither of us cared for them at all. 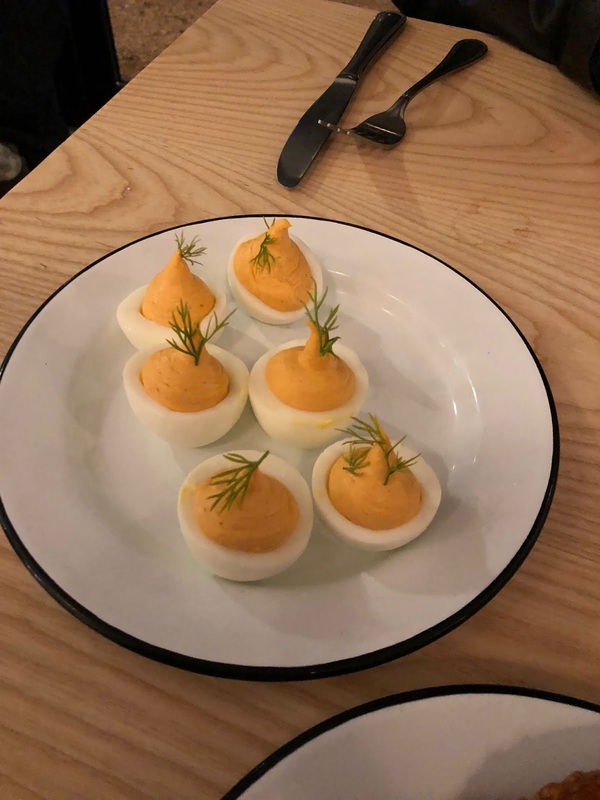 And I am a huge lover of deviled eggs, but not these. They were made with pimento cheese, spicy nduja and dill and first of all, the filling was almost too smooth, and second, they were really spicy. They just were not our cup of tea at all. We each had one and were pretty much done. 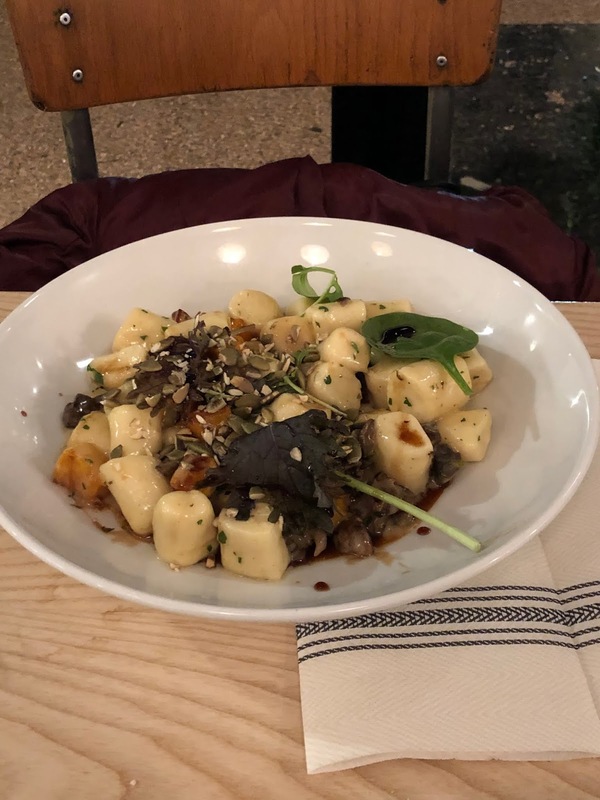 My daughter ordered the gnocchi ($19) and I had the braised chicken thighs ($24). Of the two, I preferred the gnocchi because of the kick of acid from the saba drizzled on top. The gnocchi were made with ricotta and were very light. I appreciated the richness of the mushrooms and vegetables, but it was nicely balanced with the greens and acid. I also liked the crunch from the pumpkin seeds. They are making their pastas in house, and it showed with the gnocchi. I would be interested to try one of the straight pasta dishes as well—or even the mac and cheese made with fresh pasta. The chicken thighs were good as well, but extremely rich and hearty. This is stick to your ribs food. 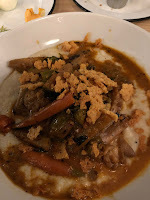 There were grits on the bottom, lots of fall veggies (brussels sprouts and carrots were predominant) and crispy parmesan crumbles on top, adding nice texture. The chicken thighs (my favorite part of the chicken) were very tender and well-seasoned. This was a very well-executed dish that just wasn’t my favorite because it was so, so rich and almost stew-like. The food here is being created and designed by a chef (Alan Sternberg) and it shows. Right now it’s winter and everything is aimed toward that seasonality, which I understand and appreciate. It’s just not my favorite kind of food. That’s just me. I look forward to trying this place again in the spring when things are maybe a little lighter. I bet it will be great. Like I said, everything is really well done (except those eggs, did not like those) and the ingredients are great and cooked just the right way. And what a welcome addition to the far north side. I am just over winter I guess and am tired of eating wintry foods. I will be keeping my eyes open for spring menu changes. And Spring can’t come soon enough! I have started a job not too far from SoBro, so that is my go to lunch area when I can sneak away. I met my friend Suzanne at Next Door this week because I thought it was about time for me to try it again after a less than stellar first experience. We met just before noon, and I was surprised to find it not very busy. On my first visit, the place was packed. I didn’t have time for a long lunch, so we jumped right to entrées. 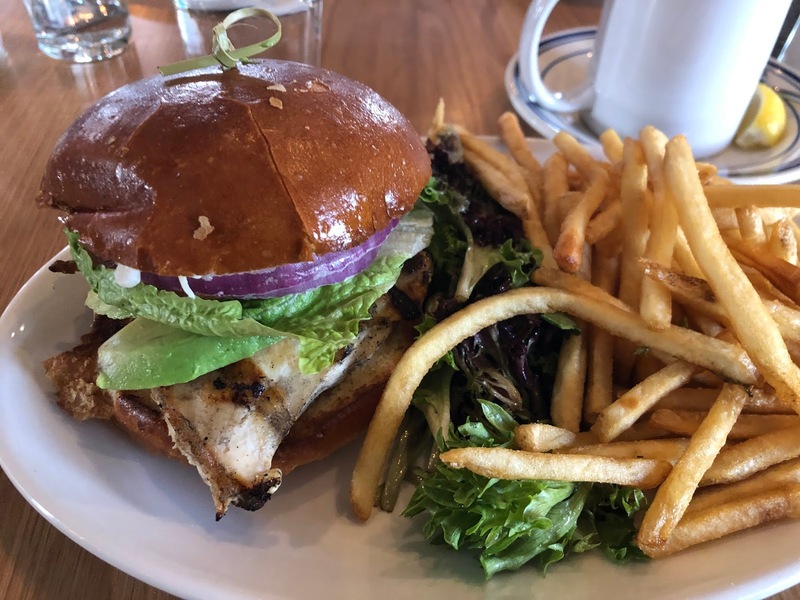 Based on the server’s recommendation, I went with the chicken sandwich ($9.95 +$2 upgrade to fries). It sounded good—all the things that typically elevate a chicken sandwich—avocado, herb aioli etc. It also had lettuce and tomato and red onion. And a bun. A very large puffy bun that was a little dense for me. It was kind of hard to eat for me because the sandwich ended up being so big. I ended up eating it kind of open-faced and took the tomato and some of the lettuce off. I wished for a little more aioli and asked for it. I initially got it for my fries but used it for the sandwich as well. It was good on the fries, and I like the whole shoestring fries thing, I just wished they were a little hotter. But they were tasty dipped in the aioli. And I wished the aioli was a little brighter. It had a lot of herbs but could have maybe used some lemon. Or garlic. Or both. An ok sandwich that I likely would not order again. I also had a bite of Suzanne’s honey Sriracha crispy shrimp bowl ($16.95). 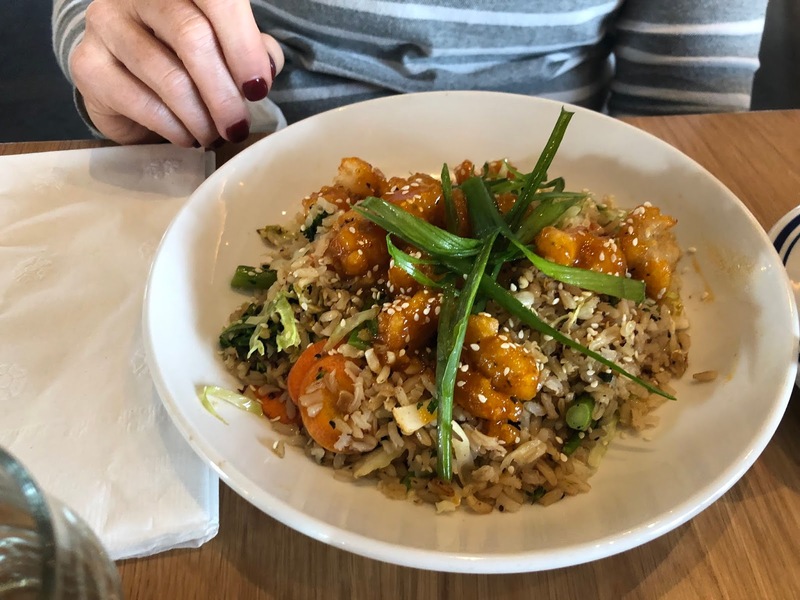 It was fried shrimp served on top of brown rice, charred broccolini, pickled daikon, carrots and cilantro slaw. She has had this dish a few times and has had mixed results, but when she had it and it was really good, she really liked it. I thought the shrimp were cooked nicely—they had a nice crunch to them and a slight sweetness I assume from the honey. There was a distinct taste of sesame oil to the dish, which I like. We both agreed it needed just a little bit more something—maybe just a little soy. Not quite enough of the pickled flavor to balance it out. Overall though, it was certainly the more interesting dish of the two. A few more shrimp would have been nice, particularly at that price point for lunch. All in all, I can’t say this visit really changed my opinion about Next Door. It’s not bad, but it isn’t a place that makes me want to rush back anytime soon. Or possibly ever. 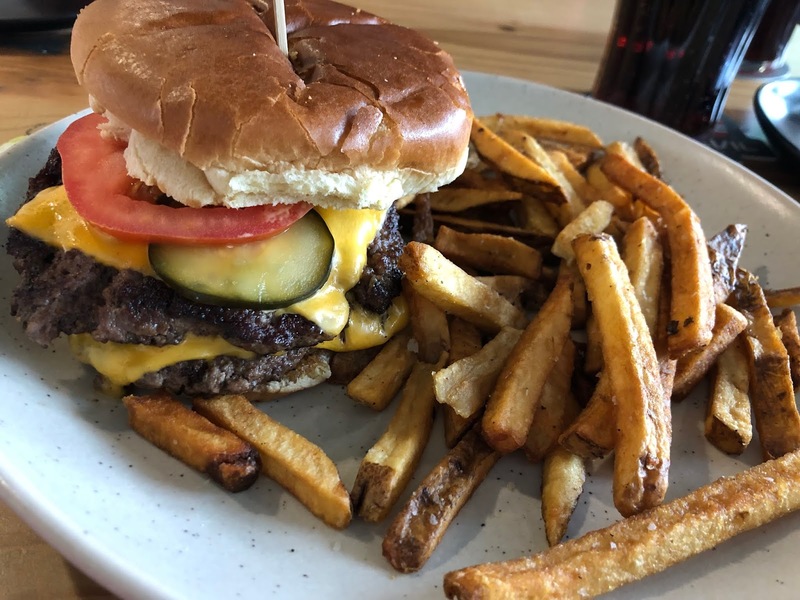 That being said, tell me your favorite places to eat in SoBro and that area, and what your favorite dishes are… I am always looking for inspiration. A couple of weeks ago we went to see the Harry Potter move/symphony event at the Hilbert Theater downtown. We wanted to eat somewhere that we could ideally park our car and leave it while we ate and then after when we went to the show. Capital Grille fit the bill, although they charged us a bunch more to stay that long. So much for a good idea. Anyhow, it has been years since we ate at Capital Grille after a series of unfortunate incidents on our last visit. We decided it was time to give it another try. They now list the calorie count on their menu, which I appreciated, but made hubby upset because he started having guilt about what he wanted to order. 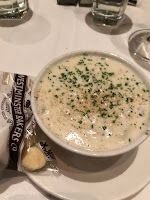 I started with a cup of clam chowder ($10), and I actually thought it was very good. I will admit, I ordered it because it was somewhat low in calories compared to some other things, but I was happy. I am kind of picky about my clam chowder, and this is one of the better ones in town. Creamy, but with nice chunks of clam, and seasoned well. 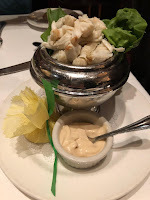 Hubby had the crab cocktail ($19) and it is very good as well. Nice big chunks of crab and I loved the sauce they served with it. It was a homemade mustard sauce—but creamy with mayo as well. Add some lemon and it was really good. 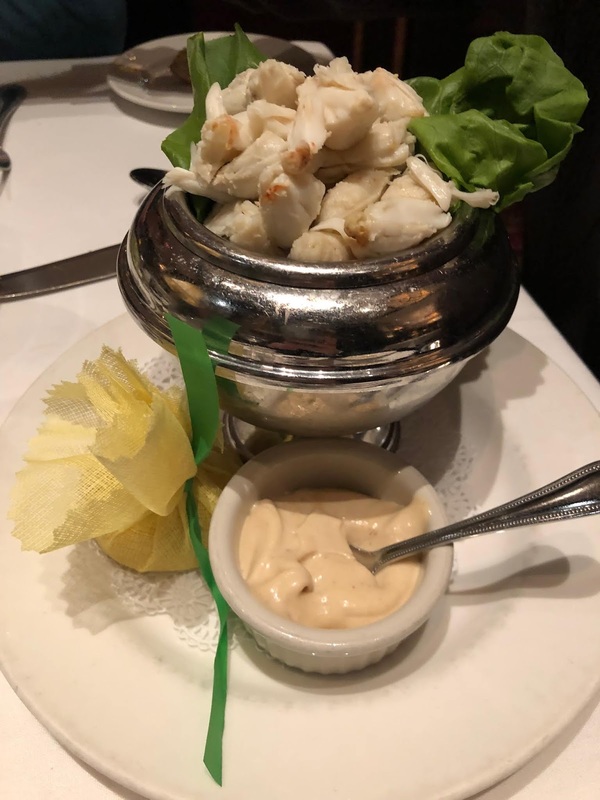 It’s not cheap, but they give you a lot of crab. I think this is totally worth ordering again. 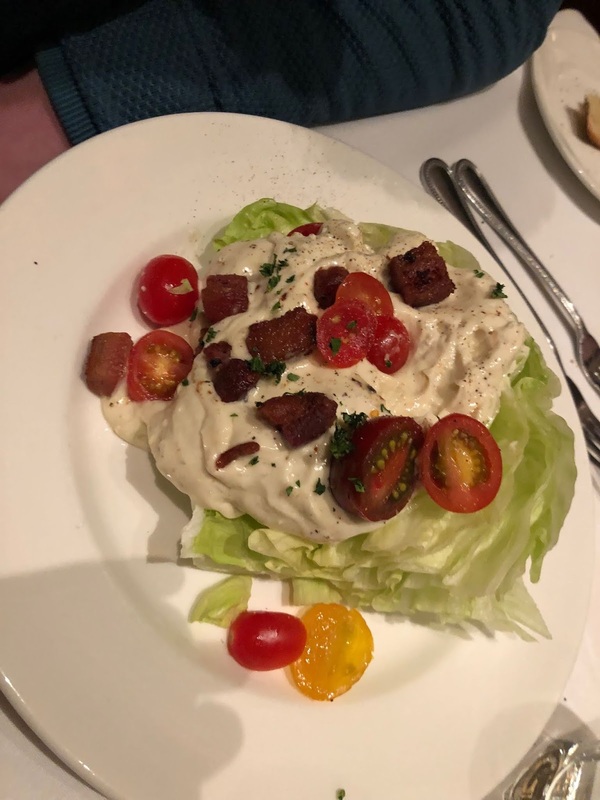 My son got the wedge salad ($12) (it’s his go-to pretty much anywhere that has one). This was a good one. They gave plenty of dressing, which is the classic problem with wedges since they are so big and dense. He almost always asks for more dressing but didn’t have to with this one. They also gave some nice large hunks of bacon on top and sliced cherry tomatoes. The boys split the Porterhouse ($51). It was huge. They were satisfied, and thought it was very good, but nothing about it that made it particularly memorable. 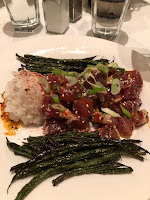 I had a special, which was their take on poke, with a lot of diced raw tuna, some rice and fried green beans. 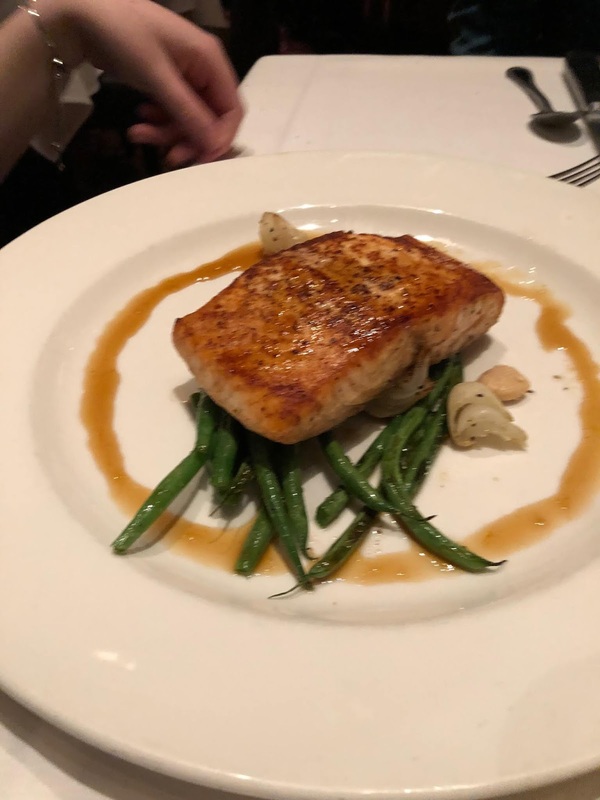 The tuna was very good quality, and it was definitely seasoned throughout and had a spicy edge, but it seemed a little one-dimensional or something. It needed some acid. Or more soy or something. It just had a spicy taste, but not much else going on. I probably just should have gone with the tartare version, which is usually seasoned with a little more variety. The green beans came across a little too fried and dried out. My daughter had the citrus glazed salmon with green beans, marcona almonds and brown butter ($37). It was a very nice piece of fish cooked just right (properly medium rare). They didn’t overdo it with the sauce and it just had a nice hint of the sweetness from the glaze. 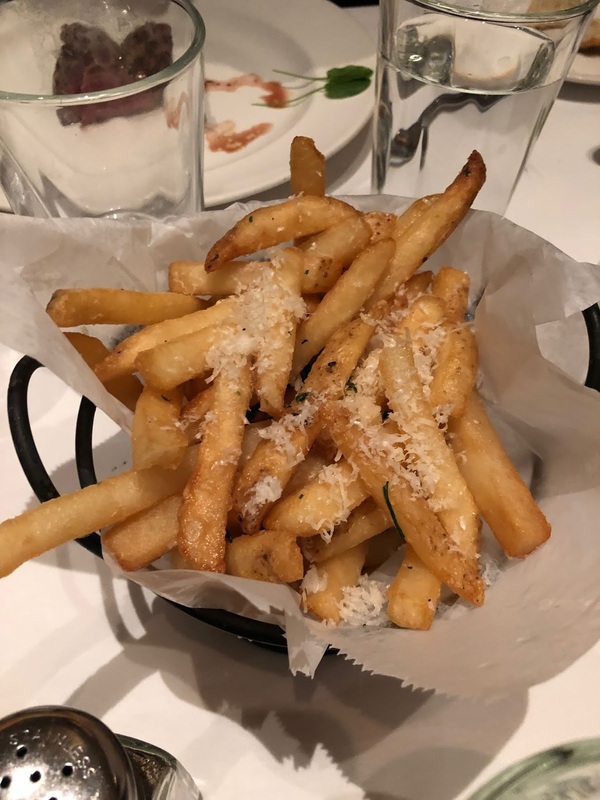 One of the stars of the dinner though was the side of parmesan truffle fries ($11). These were so tasty. The fries themselves were very light and airy, but super crunchy and hot. They use white truffle oil so the truffle oil flavor was light, but honestly, you didn’t even need it. They were just so good on their own. I’m no expert on making fries, but however they are doing it, they are doing them right. All in all, it was a pleasant meal. 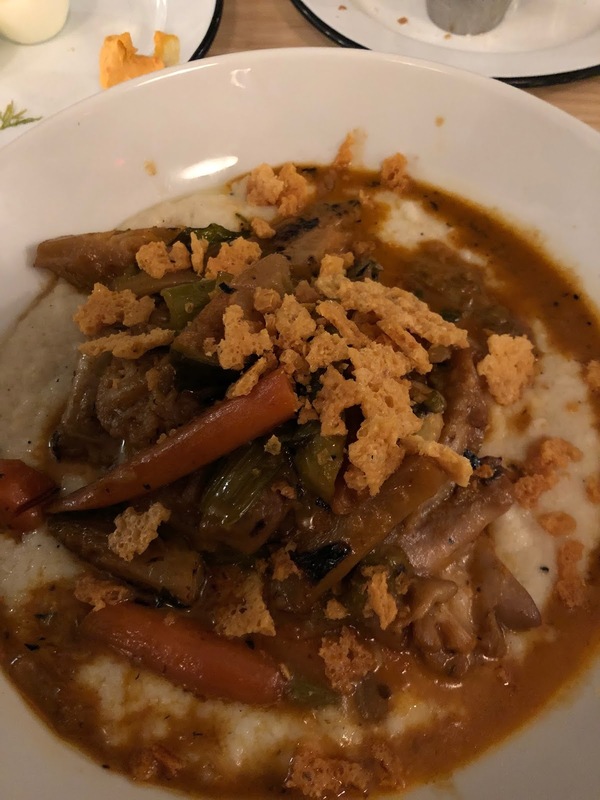 I can’t say this is a place that makes you want to rush back for any one particular thing, and it is a bit spendy, but a solid quality meal with good ingredients. At least you feel like you are getting the quality of ingredients you are paying for. 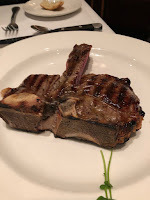 Service is polished, and I like that even though it’s basically a steak house, they have some other interesting things on the menu. Come find me on facebook at facebook.com/indyrestscene and follow me on twitter @indyrestscene and instagram @indyrestscene. All tenderloins, all the time. 4. No legal allegations against anyone (i.e. labor, health regulations, etc.) unless you have a link to back it up (i.e. to a pending suit, health violation, etc.). I reserve the right not to publish any comments not following these rules. All Content and Photos by Erin Day. Please do not reuse or republish without attribution. Awesome Inc. theme. Powered by Blogger.